Córdoba, officially known as Heroica Córdoba, is a city and the seat of the municipality of the same name in the Mexican state of Veracruz. It was founded in 1618. The city is composed of 15 barrios,(Neighborhoods) bounded to the north by Ixhuatlán del Café and Tomatlán, and to the south by Amatlán de los Reyes and Naranjal. The eastern area abuts Fortin de las Flores and Chocamán and the western area borders Amatlán de los Reyes. Córdoba has a municipal area of 226 km.2 It is divided into 176 localities, of which the most important are San José de Tapia, las Flores, Miraflores, Los Naranjos, Brillante Crucero, el Porvenir, San Rafael Caleria, Santa Elena, San Miguelito, and San Nicolás. 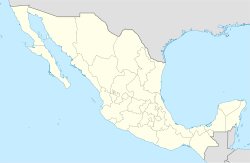 Córdoba is located in the center of the state of Veracruz, at 18º51'30" north latitude and 96º55'51" west longitude. It lies between the hills of Matlaquiahitl and Tepixtepec, at an elevation of 817 meters (2,680 feet) above mean sea level. Its climate is warm and humid, with an annual average temperature of 19.8 °C (67.6°F). There is abundant rainfall in summer and autumn, with little rain in winter. The village of Córdoba was founded in 1618 by the Spanish to protect royal interests from attacks by Gaspar Yanga's slave rebellion. 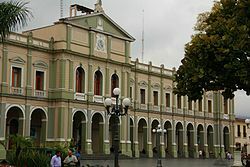 In August 1821, the Mexican revolutionary Agustín de Iturbide and the Spanish viceroy Juan de O'Donojú signed the Treaty of Córdoba here, ratifying the Plan de Iguala and confirming Mexico's independence. In 1902 Córdoba became the interchange point of the narrow-gauge Córdoba and Huatusco Railroad to Coscomatepec. The city was severely damaged by the 1973 Veracruz earthquake. The main economic activities are agriculture, ranching, industry and trade. The principal crops are sugar cane, coffee, avocado, orange, lemon, and rice, along with some non-traditional crops as anturios, heliconias and palma camedor. A highway connects Córdoba with the state's principal port, Veracruz. There is an adequate workforce, with a relatively low annual wage, providing opportunities for hiring for industry. Córdoba is the focal point for the local sugar milling and coffee processing industries, and it is also an important place for marketing and refining tropical fruits. Several medical institutions provide public-health services in Córdoba, including the ISSSTE, the IMSS, and the SCSP. There is also a local Cruz Roja (Red Cross) hospital, and several private hospitals. The city has a large number of entertainment centers, including billiard halls, ballrooms and discothèques. Cordoba has three libraries, three auditoriums, a theatre and a museum. From 1902 to 1953, Córdoba was served by the Córdoba and Huatusco Railroad narrow gauge railroad. The line operated as a unique and scenic 2 ft (610 mm) gauge branch of Ferrocarril Mexicano from 1909 through 1951. With a 2010 census population of 140,896, Córdoba is the fifth-largest city in the state, and also one of the top tourist spots in the region. It is located on Federal Highways 190 and 180. Neighbouring cities are Naranjal, Fortín, Ixtaczoquitlán and Orizaba. The municipality has an area of 139.01 km2 (53.67 sq mi) and a population of 186,623, which includes that of many outlying small communities, the largest of which are San Román and Crucero Nacional. One of Córdoba's most important locations is its zócalo (main square). The square, called the Parque de 21 de Mayo, uses the traditional Spanish layout, with a church on the east side, the Palacio Municipal (city hall) on the west, and commercial establishments on the north and south sides. ^ "Principales resultados por localidad 2010 (ITER)". Instituto Nacional de Estadística y Geografía. 2010. ^ a b "Informacion general". Gobierno del Estado de Veracruz. 2008-02-05. Archived from the original on 2011-05-20. Retrieved 2008-02-05. ^ a b "El INEGI en su entidad Veracruz de Ignacio de la llave". Gobierno del Estado de Veracruz. 2007-11-07. Retrieved 2008-01-27. ^ a b c d "Córdoba Veracruz-Méx". Córdoba.com.mx. 2007-11-07. Archived from the original on 2008-01-25. Retrieved 2008-01-27. Best, Gerald M. (1968). Mexican Narrow Gauge. Howell-North.